Tourism Richmond recently completed its second annual Stakeholder Survey in May 2018. Thank you to those of you who participated – your feedback is invaluable to us! We designed this survey to understand two things: How stakeholders like yourselves view our performance as a Destination Marketing Organization, and to show the areas we need to improve in so we can provide better services to you. We conducted our first stakeholder survey last year to establish benchmarks and now, we’re ready to share our top highlights of the 2018 survey. Over 75% of stakeholders agree or strongly agree that they understand what Tourism Richmond does for their business. This bit of news, we’re glad to hear! But if you ever have any questions about any of our stakeholder programs such as the cooperative marketing investment fund, the Pacific. Authentic. Scholarship program, our robust travel media relations program, or what our travel trade and Meetings & Conventions departments can do for your business, please don’t hesitate to reach out to us. 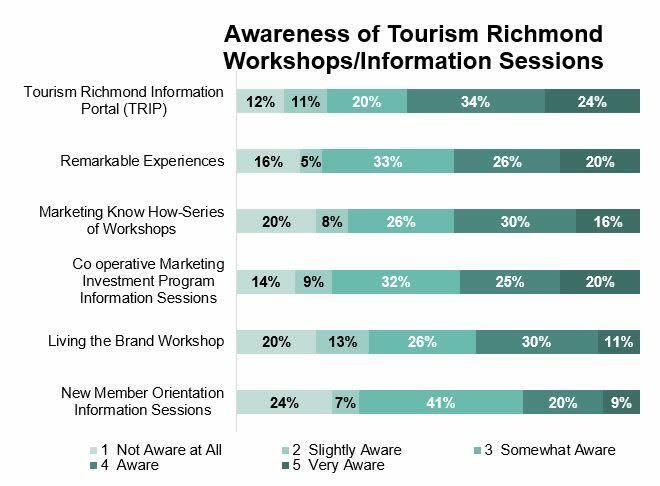 Of all the Workshops / Information Sessions, the Tourism Richmond Information Portal (TRIP) has the highest levels of awareness. We believe this is partly because of the number of different mediums we’ve used to try and spread the word. We won’t lie – we’ve been busy in the past year. CEO Bruce Okabe’s vision of turning Tourism Richmond into a next-generation destination marketing organization, complete with a new brand and new direction resonated deeply with stakeholders. The 2018-2020 business and marketing plan laid out Tourism Richmond’s marketing plan with a clear roadmap, and the 2017 Annual Report reported on exactly what we had set out to do. 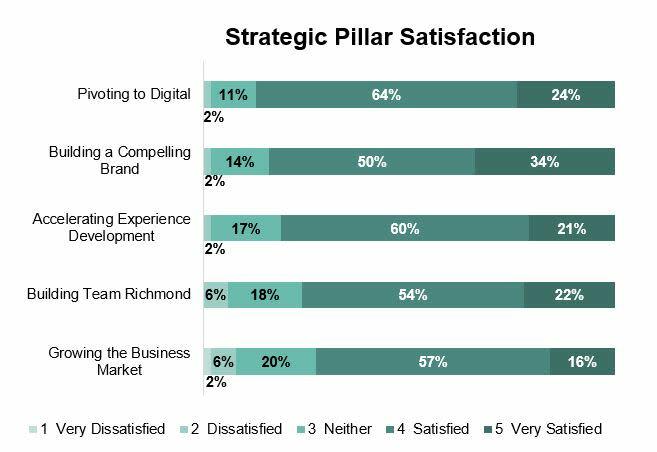 Of the five key strategic pillars, stakeholders felt Tourism Richmond performed best on Building a Compelling Brand and Pivoting to Digital. Stakeholders scored Tourism Richmond lower on Growing the Business Market. Specific comments from stakeholders elaborated a desire for Tourism Richmond to work harder at networking at tradeshows and conferences, with RTOs and business travellers. Ensure we communicate information regarding workshops and sessions available to stakeholders through a variety of different mediums. Improve how we network and build relationships at conferences and tradeshows – and show you how we’re doing it. Continue to increase your understanding of what we do overall to serve our market. We’re strong believers that our city will be better at attracting visitors when we all work together to make our destination stand out. To do this, we’re asking that you refer your industry partners and peers in tourism-related industries to sign up as Tourism Richmond stakeholder. Aside from the free listing on our high-traffic website, stakeholders also receive access to market insights, as well as paid marketing opportunities. Share this link with anyone you think might be interested. Please note they need to be in Richmond, be related to tourism in some way, and be visitor ready! Additionally, we recommend you come to the Visitor Volume Project Stakeholder Presentation on July 10th at the Gulf of Georgia Cannery National Historic Site. During this presentation, we’ll review insights and recommendations from our latest research. Register here.